Chances are, after practicing for a while, a quilling paper crafter is bound to have tons of bits and pieces laying around, taking up space valuable crafting space. The question is: what to make from all those bits? One can only make so many cards and gift tags. So, in order to clear up some of my desk space and create something new, I spent last week making some quick quilling paper bookmarks. Since I wanted to keep this to a quick craft, I decided to base my bookmarks off a traditional long, rectangle shape. You’re welcome to use the same steps in any other shape you’d like, but if you’d like to use the same design I did, I made up a printable bookmark template that you can use. Once you’ve decided on the shape of your bookmarks, start building the base. I was looking for my bookmarks to be fairly sturdy, so I traced my rectangles onto thick card stock. TIP: If your printer allows, print the template right onto the card stock you’ll be using to save a step! Next, cover your bookmarks with some colorful paper. I chose a few sheets of scrapbook paper in shades of pale blue and yellow, and used a strong glue-stick to stick the card stock bookmark to the paper. Trim off any excess, if necessary. A reliable craft knife will come in handy here. I have tons of paper lemons hanging around from my tutorial on quilling paper citrus slices. For a modern twist, try rolling a few strips together into a really, really big tight coil. I was looking for a way to use some of my quilled strawberries, too. They look great with these strips of green! Now, these won’t be the “throw a book in a bag and carry it all over town” type of bookmark. 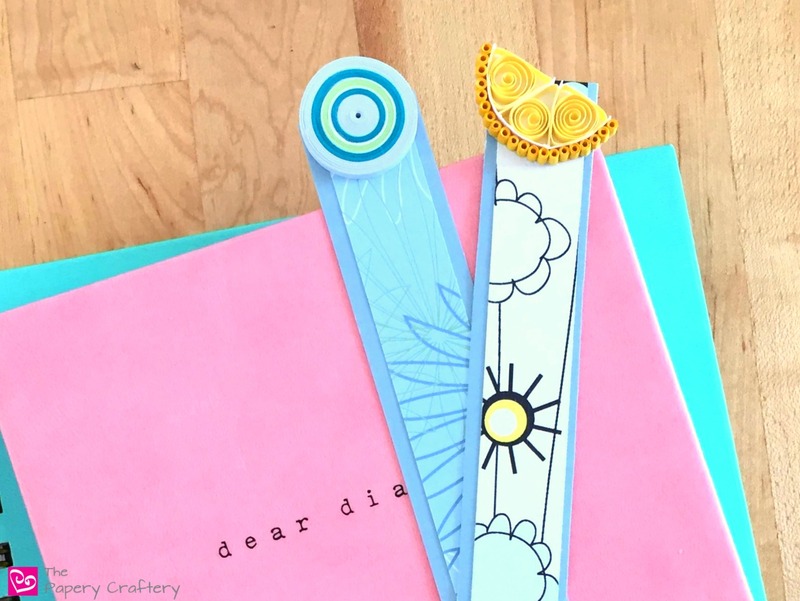 Even though quilling is pretty tough (especially if you choose a tightly formed design), these bookmarks might be best left to hold the pages of coffee table books or nightstand journals. I think these could be a truly unique gift for your child’s teachers. Or a simple project to motivate young readers this summer. And remember, quilling paper bookmarks don’t have to be a rectangle. Try different shapes that will enhance your quilled design! Don’t forget to leave a comment below. Tell me what you’re going to use to decorate your bookmark so everyone can be inspired! These are really cute bookmarks! They look very easy to do and yes what a perfect teacher’s gift! Thanks! They’re completely customizable, too! These are adorable. The strawberry one is very cute. These would be a great summer projects to do with kids. These are adorable, thanks for sharing. My almost 9 year old would love them! These are so cute! I’m not the most crafty person, but I do like sitting down and making things; definitely need to make myself one of these bookmarks! Love the little fruits! So adorable. These are so pretty! I usually just grab a piece of paper and slide it into my book (very, very sad I know) but this would make my reading so much more fun. They look amazing and so cute, I am loving these series of posts about quilling! Thank you for sharing them with us Meredith. Awww, thanks for the kind words! My goal is to make crafters see how simple and versatile quilling can be!